The humanitarian impulse has not vanished from US foreign policy. It has simply split into two camps. Nixon, Kissinger, and a Forgotten Genocide. A Global History of the Creation of Bangladesh. This was self-pity dressed up as insight. Humanitarian interventions are not about to perish from the earth, but their backers are experiencing an acute crisis of confidence. The humanitarian style of argument, which typically includes a link to a gruesome YouTube video, a litany of past horrors (Rwanda, Srebrenica, Darfur) and a map with a pinpointed target, is no longer as self-evidently persuasive as it once was. Humanitarians were very effective in building their case in the 1990s, when many of them witnessed atrocities firsthand in Bosnia, Kosovo and beyond. Their cause went on to enjoy some apparent successes (Sierra Leone in 2000; Liberia in 2003). More impressive, the interventionists survived a string of failures—in Haiti, Somalia and Iraq. But they have learned curiously little from their day in the sun. They are still fighting intellectual battles that they won twenty years ago, when their principal antagonists were, on the right, foreign policy “realists” who believed the national interest always trumps humanitarian concerns, and on the left, anti-colonialists who saw every humanitarian intervention as a cover for imperial interests. The realists not only lost out to the humanitarians on policy, but their rhetoric was also co-opted. It’s now commonplace to hear humanitarian interventions justified on the basis of “national security” or “long-term US interest” or even—as John Kerry, of all people, recently reminded us—“credibility in the world.” As for the anti-colonialists, they may still make plenty of noise, but their views have never been more blinkered. Only an anti-imperialist trapped in amber could believe that the recent French intervention in Mali, explicitly requested by the government in Bamako, was a neocolonial adventure, or that a US strike against Bashar al-Assad would culminate in Marines hoisting the Stars and Stripes over Mount Qasioun. No, the most active resistance our humanitarians face today comes not from realists or anti-colonialists, but from a newly articulate breed of pragmatists who often agree with humanitarians about their ends but disagree about their means. Call them Hippocratic humanitarians. Their arguments are marked less by moralism than by political calculation; less by a priori principles than by a consideration of the foreseeable consequences of action; less by a “responsibility to protect” than by a responsibility not to do more harm. The humanitarian impulse has not vanished from American foreign policy—rather, it has split into two camps. Members of those camps disagree about whether or not to arm and train the Syrian rebels, or whether or not Assad must go. The president, who contains multitudes, vacillates between the two sides. Hippocratic humanitarians may not always triumph—or even deserve to triumph—over their interventionist peers, but in the current international climate, their reasoning has carried the day. The Princeton politics professor Gary Bass has a strong claim for being the house historian of humanitarian interventionism. This post was formerly filled by Power, whose “A Problem From Hell”: America and the Age of Genocide (2002) remains the most popular account of America’s sins of omission when it comes to stopping civil wars, mass slaughter and genocide around the world. In Power’s universe, you are either a voice in the wilderness crying “Genocide!” (Raphael Lemkin, William Proxmire, George McGovern) or a morally inert bystander. Bass, who was Power’s colleague at The Economist when both reported on the Kosovo war, took a marginally more subtle approach in his own history of humanitarianism, Freedom’s Battle (2008). His aim was not only to indict American inaction in the past, but to highlight a noble tradition of humanitarianism to which we could subscribe, stretching back at least to Byron’s and Gladstone’s attempts in the nineteenth century to rescue Greek nationalists and Bulgarian Christians from their Ottoman oppressors. Bass did not deny that British imperial interests vied with humanitarian motives, but he argued that it was possible to isolate those interests from some genuinely positive effects. As a work of history, Freedom’s Battle displayed the limits of aggressively reinstating moralism in our understanding of the past [see Samuel Moyn, “Spectacular Wrongs,” October 13, 2008]. Bass’s consistent reliance on moral judgments in lieu of causal understanding only added to the burdens of his false rhetoric. But as a historical justification for taking action in the present, Freedom’s Battle was catnip for interventionists. Christopher Hitchens, Bernard-Henri Lévy, Ignatieff and Power all lavished it with praise. Bass’s new book, The Blood Telegram, might at first appear to wander far afield from the usual humanitarian haunts. It tells the story of the murderous campaign by the Pakistani military dictatorship to hold onto its eastern Bengali-speaking province after the country’s first democratic elections in December 1970, when the party from the more populous region of East Pakistan swept the polls and was about to gain a parliamentary majority. The victor, Mujibur Rahman’s Awami League in Dhaka, campaigned on promises of making East Pakistan more autonomous, which meant determining its own trade terms and currency as well as raising its own militia. All of this was too much for the regime in Karachi. Gen. Agha Yahya Khan’s junta and Zulfikar Ali Bhutto’s Pakistan People’s Party balked at being ruled by East Pakistani upstarts. When the citizens of Dhaka staged a mass strike in protest, Yahya dispatched troops to put down the revolt in what became known as Operation Searchlight. Within a year, the Pakistani military had killed hundreds of thousands of its fellow citizens, jailed the Awami leadership, and driven upward of 10 million people, mostly Hindu Bengalis, over the border into India. Faced with one of the greatest refugee crises in world history, Indira Gandhi responded at first by backing the Bengali rebels, the Mukti Bahini, in a drawn-out guerrilla war. In December 1971, the war became conventional when India provoked and easily destroyed Pakistani forces, established Bangladesh as an independent nation-state, and definitively reconfigured the politics of South Asia. The conflict suits Bass’s humanitarian agenda for two reasons. First, it serves as a platform for him to show, yet again, how morally egregious and counterproductive a “realist” vision—this time emanating from President Richard Nixon and his national security adviser, Henry Kissinger—was in practice. The two only exacerbated the violence by supporting Pakistan in a war they thought it couldn’t win. Second, the war allows Bass to challenge a cherished premise of the anti-colonialists by presenting a case in which it was not a Western imperial power but a Third World state that orchestrated the humanitarian intervention. Gandhi’s invasion of East Pakistan was only one of several postwar interventions undertaken by Third World nations. In 1979, Julius Nyerere’s Tanzania drove the sadistic regime of Idi Amin out of power in Uganda; earlier that year, Lê Duan’s Vietnam took down the genocidal Khmer Rouge in Cambodia. But for Bass, the Indian example is particularly uplifting, first because India was a democracy; second because Gandhi was forced to respond to the humanitarian agitations of her own people. The Blood Telegram thus fights the two old foes of humanitarian interventionism—realists and anti-colonialists—on new historical ground. But what makes the book noteworthy is that in the course of making his two-flank argument, Bass both refines the case for contemporary interventionism and sharply reveals the limits of the humanitarian imagination. No one doubts that the Pakistani civil war was a tragedy of American diplomacy. Not only did the Nixon administration do little to alleviate the crisis, but it took active—and, as Bass documents, highly illegal—steps to support West Pakistan with military equipment that it knew was to be used against civilians. The cognac-swilling Yahya was that rare foreign leader whom Nixon personally liked, and he made himself invaluable by offering to open up communication between the United States and Communist China. When the Pakistani military began its crackdown in Dhaka, Nixon and Kissinger insisted on funneling millions of dollars’ worth of munitions to Yahya. As the US Congress prepared to pass measures halting the sale of arms and State Department officials balked at Pakistani requests, Nixon and Kissinger scrambled to find a workaround. With a morally anxious George H.W. Bush looking on at the United Nations, they went so far as to explore the option of sending weapons through proxies like Jordan and Iran. International and domestic opinion swiftly denounced their efforts, with even the Wall Street Journal editorial page making a cool plea: “We would not mind seeing the US lose its prominence in the arms-furnishing business.” But Nixon and Kissinger, not unreasonably, bet that the public outcry would wane once they managed their opening to China. The jewel in the crown of their foreign policy was well worth the lives of a few hundred thousand Bengalis. Duets like this appear throughout the book. Yet for all the outrage they may inspire, the year 1971 was still a point in the twentieth century when the idea of outside, unilateral humanitarian military intervention was barely credible. Solzhenitsyn had uttered his famous line—“There are no INTERNAL AFFAIRS left on our crowded Earth!”—only the previous year. The main worry for most official observers of the Pakistani civil war was that anything that helped East Pakistan too much—anything, that is, beyond basic humanitarian assistance, such as food shipments—would lead to its independence in the form of Bangladesh. Pretty much no one at the time welcomed this prospect: not the United States or the Soviet Union, not China, not the United Nations, not even many Bengalis themselves, who were more determined early on to win regional autonomy than outright independence. The Blood Telegram is in part a celebration of the new world that was created in the wake of 1971, in which humanitarian interventions are always and everywhere conceivable. To an extraordinary degree, 1971 revealed the ineptitude of “realism” as a guide to US decision-making. Bass makes short work of Nixon and Kissinger’s grand strategic pretensions and, perhaps most damning, shows how their “realism” failed on its own terms. Their conviction that Bangladesh was a critical pawn in the Cold War rivalry was not shared by the Soviets, who, while drawing closer to Gandhi’s government, were not prepared to back her war against Pakistan to the hilt. As for the opening to China—which could have been effected through back channels in Paris, Warsaw or Bucharest—there was little chance of getting China to pressure North Vietnam into a peace settlement, and little justification for Nixon and Kissinger’s fears of losing face with the Chinese by letting down their Pakistani allies. In 1971, Mao was just as eager as the Americans to start relations. His army had been embarrassed in a border skirmish with the Soviets in 1969, and he worried about Indian disruptions on his southwestern border. More critical, the Cultural Revolution had turned Mao’s attention inward, severely limiting any appetite for foreign entanglements. The vastly complicated international dimension of the Indo-Pakistan War is expertly mapped out by Srinath Raghavan in 1971: A Global History of the Creation of Bangladesh, which, when read alongside Bass’s account, has the effect of making The Blood Telegram seem like an all-too-Washington-centric account of the crisis. A former officer in the Indian army, Raghavan analyzes with precision the military operations and economic realities of 1971; he also offers an indispensable array of international perspectives on the war, with the views from Beijing, Bonn, Ottawa and beyond, all analyzed in concert. Raghavan’s book makes clear that for all the power it projected, the United States was never the prime mover in the conflict, and that even if Nixon and Kissinger had been moral paragons, there is little reason to believe they could have dramatically changed the outcome. For his part, Bass sounds more like a Hippocratic humanitarian when he notes that he is mostly concerned with how feasible it would have been for Nixon and Kissinger not to make the refugee crisis worse. The “Blood Telegram” in his title refers to the communiqué sent by Archer Blood, the US consul general in Dhaka, protesting the mass killing of Pakistanis and objecting to Nixon and Kissinger’s support of Yahya. In the figure of Blood, a loyal bureaucrat who destroyed his career by becoming a critic of Kissinger, Bass appears to offer us another candidate for Samantha Power’s Humanitarian Hall of Fame. But while Blood is the perfect narrative foil for Bass’s American audience, the true hero of his book is Indira Gandhi, and it’s with her that the politics of humanitarianism get interesting. Gandhi was painfully aware of how alone she was in confronting one of the greatest refugee crises in history. Despite making pleas around the world, her government lacked the money and supplies to keep the refugees alive as they overflowed the cities of Assam, Tripura and West Bengal. Her difficulties were compounded by not having any true allies. Nixon hated Gandhi: “I dropped stilettos all over her,” he told Kissinger after meeting with her on her visit to Washington. The Arab states were firmly on the side of their fellow Muslim nation. China had defeated India in border clashes as recently as 1967 and worried about Gandhi warming to the Soviets. The Kremlin leaned toward some of Gandhi’s leftist advisers, like the wily P.N. Haksar, but they never trusted her own murky politics. As the historian Ramachandra Guha has noted, unlike her father, Nehru, it was impossible to tell what Gandhi really believed about capitalism, the Cold War, relations between Muslims and Hindus, or even democracy. But as commander in chief, she proved extremely adept. India not only lured Pakistan into a fight that Yahya could not win—with a blitz by Indian forces on the East Pakistani town of Boyra—but also responded overwhelmingly to the Pakistani aerial counterattack, Operation Genghis Khan, launched on December 3, 1971. Two weeks later, the Pakistani commander, Amir Abdullah Khan Niazi, surrendered to Indian general J.S. Aurora on the Dhaka race course. Of course, the war was not simply, or even primarily, humanitarian: from the outset, Gandhi saw it as a chance to dismember Pakistan once and for all and bring East Pakistan under India’s influence. Nevertheless, there is little doubt that Gandhi saved hundreds of thousands of lives by bringing the Pakistani civil war to a quick close. But if the Indo-Pakistan War was one of the most dramatic humanitarian interventions of the twentieth century, it was an intervention of a very particular sort, having been undertaken by a country that had itself been severely impacted by a civil war, instead of by an outside force with more of a choice about whether to act. Bass is right to offer the analogy of Turkey and Syria today. The Bengalis pouring into India in 1971 were not unlike the Syrian refugees now fleeing into southeastern Anatolia. Turkey is backing its own set of rebels, just as India backed the Mukti Bahini, and almost every state in the world today would be against Turkey if it were openly to attack Assad’s regime on humanitarian grounds. It is a credit to their commitment to the peculiarities of 1971 that both Bass and Raghavan refrain from taking Indira Gandhi’s action as a guide for the present. History, as Jacob Burckhardt said, does not make us clever for the next time; it may only make us wiser in general. For all the passion of Bass’s book, there remains something troubling about the narrowness of its scope and argument. It opens and closes with the bloodshed of 1971 and spares only three pages for the subsequent fate of Bangladesh, which has endured one of the worst fates of any country in the decolonized world. Independence may have yielded a national haven for Bangladeshis to live without the threat of genocide, but it did little to improve the quality of most of its citizens’ lives. Shortly after 1971, Mujibur Rahman, whose victory in that year’s election had precipitated the civil war, and whose imprisonment by Pakistan had inspired Bengali resistance, was assassinated in a military coup. There have followed decades of assassinations and political turmoil, during which the corrupt Bangladeshi state has done little to protect its people from the depredations of the international labor market. The violence and corruption are so rooted in 1971 that the country’s current leader, Sheikh Hasina, the daughter of Mujibur Rahman (yes, the violence has come full circle), has firmed up her political base by orchestrating show trials of suspected Pakistani collaborators from more than forty years ago. This fall, thousands of Bangladeshis filled the streets of Dhaka after a life sentence was handed down to the Islamist politician Abdul Quader Mollah for his complicity with Karachi in 1971. The protesters were aggrieved by the verdict; they demanded the gallows. By restricting his account to the bloody days of 1971, Bass ignores almost everything that happened before and after the crisis, leading the uninformed reader to believe that the events of 1971 occurred in a vacuum and so could be resolved in a vacuum. The point is not that humanitarian interventions aren’t ever warranted, but that their adherents rarely ask themselves why they’ve been forced to undertake them in the first place. Humanitarian interventionists today are like mosquitoes buzzing from one bloody zone to the next, without taking the time to consider the forces underlying them, or why such predicaments always consist of the same set of interveners and a revolving cast of victims. It is true that the French intervention in Mali this year was necessary, but what were its root causes? For decades, the Malian government has ignored its poorer region to the north and failed to follow up on its promises of development projects, and the West and Mali were happy to brush aside Azawadi claims to self-determination. Only when roving Islamists appeared on the scene—having arrived in Mali courtesy of another humanitarian intervention in Libya—did Bamako and Paris agree that an intervention needed to be brought off quickly. In the past, Bass has suggested that we might consider new international arrangements in which each region has designated human rights defenders, citing the noble charge led by the Australian government to stop the Indonesian-led genocide in nearby East Timor. But it seems almost characteristic of his perspective that he would neglect to mention that as a price for their humanitarian aid, the Australians have taken control of East Timor’s offshore oil and gas reserves. In an age of multitasking, is it too much to ask American liberals to hold a structural critique of political economy and a concern for physical suffering in their minds at the same time? No matter how “successful” humanitarians and their interventions may be, they must realize that they themselves are symptoms of, not solutions to, a much grander failure. It may be a sign of progress that the Samantha Power brand of humanitarianism—which was always more about salving the West’s moral conscience than empowering others—is in decline, and that Hippocratic humanitarianism is on the rise. But only when humanitarians of all stripes learn to see their emergency missions within a much larger landscape of economic injustice will they become “humanitarian” in the true sense of the word. Yes, Indira Gandhi’s intervention was a success. But can anything really be counted a “success” if the state born of it has never recovered? 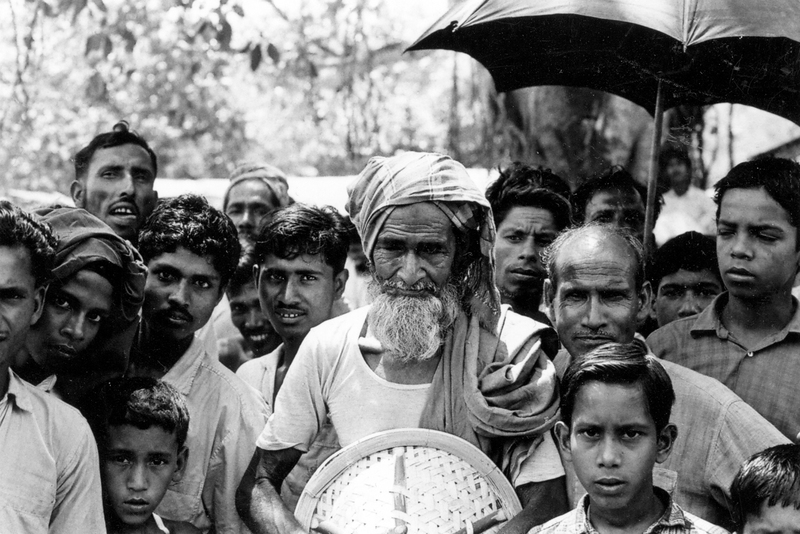 In 1971, Bangladeshis who fled starvation and death by crossing into India could at least expect to be treated as refugees. Lately, they risk being shot on sight. Thomas MeaneyThomas Meaney, a doctoral candidate in history at Columbia University, is co-editor of The Utopian.